People in arid and semi-arid land in Niger and Mali are facing the impacts of land degradation and, as a consequence, their income from agriculture is reduced because of the deterioration of land resources. This study was executed to tackle the challenge and the negative impacts that go with it, and develop a technical guideline for extension officers in order to sustain agricultural productivity through soil and vegetative conservation. Arable lands in the Sahel region in semi-arid West Africa are being degraded through intensive land-use activities such as exploitative farming, extensive animal husbandry, and excessive fuelwood collection. 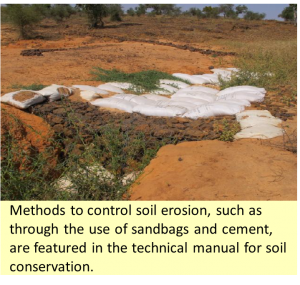 Hence, it is necessary not only to introduce conservation techniques against degradation of soil and vegetation, but also to facilitate and get the villagers involved in conservation efforts. In this way, villagers become part of the solution. In addition, it is essential to have a regional or local support system to encourage and guide the villagers in tackling natural resource management issues. Against this backdrop, Japan International Research Centre for Agricultural Sciences (JIRCAS) implemented the “Study on the Establishment of Methods of Management and Conservation of Resources for Agricultural Production” with the Institute of Rural Economy in the Republic of Mali and with the Ministry of Agriculture in the Republic of Niger. The study was executed from 2008 to 2012 with subsidies by the Ministry of Agriculture, Forestry and Fisheries (MAFF) of Japan. Four villages in Mali and two villages in Niger were selected as target areas for verification. Conservation activities (e.g., erosion control, reforestation, and soil fertility improvement) were carried out in these villages using certain approaches and techniques to clarify the constraints, and to emphasise and reinforce the role of villages and relevant organisations. All applied approaches were compiled to form the guideline and technical manuals. In the guideline, problems are resolved by applying the question method. The question method brings existing problems to light, hastening the problem-solving process with the cooperation of villagers. The method lets the local government officer acts as facilitator, thereby allowing wide participation and enabling the villagers to clarify and solve the problems by themselves. The approach used in the guideline is widely applicable in the Sahel region because it contains detailed procedures and examples that local government officers in agriculture, forestry, and environment can carry out during conservation activities with villagers. The guideline has already been certified by the Ministry of Agriculture in Niger and by the Institute of Rural Economy, Ministry of Agriculture in Mali. 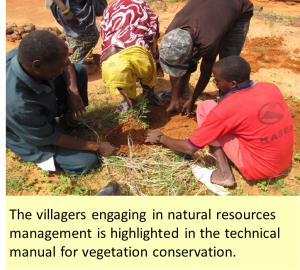 Likewise, the technical manuals which are presented in 10 separate volumes, including one on forest conservation, have been highly appreciated by officials from relevant agencies in Mali and Niger because they clearly illustrate the information and procedures needed by local government officers to guide and advise villagers. The technical manuals developed by the study are available from the links below. It may be applied to other countries in arid/semi-arid areas.